I have written a more IN DEPTH narrative twitter guide HERE – but for a quick reference I have also written this bullet point guide (below). NOTE: When a message is displayed in Twitter, it automatically has the senders name at the start. E.g: LucasBlack This is my simple guide to using twitter. I hope it helps. Type in the box and hit UPDATE. E.g: LucasBlack Well I’ve arrived at work for another day. I really fancy a cup of tea. Type the persons tweet name with an @ attached to the front as the very first part of the message. Hit UPDATE. e.g: LucasBlack @ionacosmetics Hi there, I hope you like this guide enough to share with other people. Because of the @ at the start, this message will flag up in the persons @REPLIES tab. Type a D then space then the persons tweet name at the very start of the message. Hit UPDATE. e.g: LucasBlack D ionacosmetics Hi there, I have a secret that I can only tell you. This is how I would do it. No matter what is written, only the person sending and receiving the message can see what is in the message. 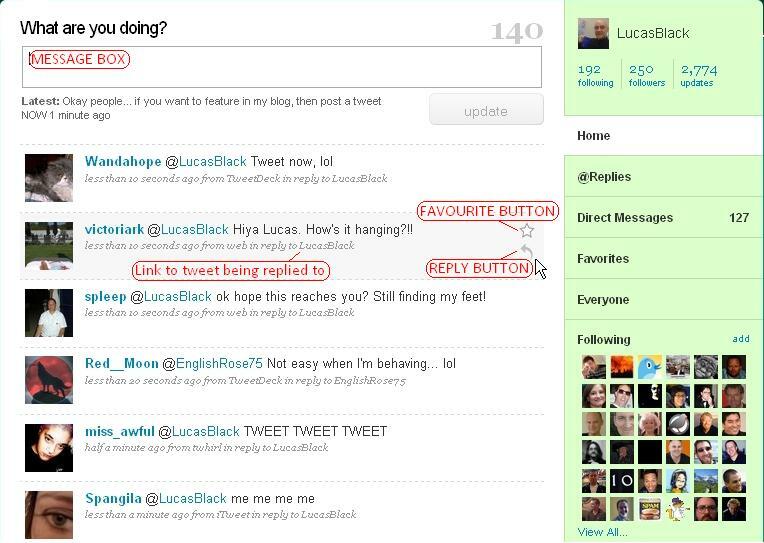 e.g: LucasBlack I am replying using the reply function so you know what I am replying to. Reply should be used as it lets people know WHAT you are replying to. There is more in the other guide. Type something BEFORE the @ sign (e.g – Hey! ), then type the persons name and message. Hit UPDATE. e.g: LucasBlack Hey everyone, and especially @ionacosmetics. I hope you like my guide! The moment you start a message with ANYTHING other than D or @ it becomes a public message. Although you have mentioned the person in the tweet, it WILL NOT show in their @Replies tab. Type something BEFORE the @ sign, then type the persons name and message. Hit UPDATE. e.g: LucasBlack Hey everyone, Why not follow @hedgemag and @howlingwolf50 as they have some good stuff to say. This is just like the previous message to an individual. It works because mentioning anyone’s name with an @ attached to the front will allow people to click the name and go to that persons twitter page. Type RT then @ and the name of the person whose tweet you are repeating, then the message. Hit UPDATE. By typing RT you are crediting the person in the message. It is the polite thing to do, as it wasn’t your material. Leave enough characters so the next person who wants to retweet your message can add RT @YOURNAME (and a space) to the start of the message. Well, that covers a fair few of the bases. If you want to know more, or want to add more to this list, then please let me know. There is also a more narrative and in depth guide that I have written HERE. This includes how to use hash tags and how to post pictures. People use it as a text message – a micro blog – a chat room – a sales forum – a notice board…. however they want. The trouble is there are a few simple things that you need to know to get the most from it – but these things are hard to explain to new users in the 140 character limit that Twitter messages are comprised from. So I decided to put a little blog together to answer some questions. In the words of the great book…..
Firstly, there are lots of different utilities that can be used to talk and read tweets (twitter messages). I prefer to use iTweet – as it is by far the simplest and most versatile of the free web based Twitter tools out there. You can go onto other applications at a later date – but I highly recommend iTweet. iTweet is just a web page – you don’t need to download it, you don’t need special software – and it is free. For this simple run through though, I shall mainly use www.twitter.com itself. You write tweets made from 140 characters. That’s it. E.G: Wow… so this is twitter…. I guess I beter say goodbye to my life then. You follow other people and read their tweets. These are people whose tweets you like the look of so you select to follow them. These are people that you are following. E.G: CaptainVtec says I went for a walk today – The weather was fantastic. Some people may even choose to follow you for the same reason. These are your followers. What ever you type can be seen by ALL the Twitter users in the World (unless you go private – which really defeats the object of having a public noticeboard). Generally the main (Home) window in twitter is the one with just your tweets (messages) of the tweets of the people you follow. There is also a Replies option that lets you just see tweets addressed to you. This is where we start to expand what you can do with twitter. Please refer back to this picture throughout this blog entry. If you want to send a message to one person in particular you can flag it to their attention by using the @ symbol. If one of my followers wants to flag something up so I see it, then they address it to @LucasBlack (that is my twitter name). This message will be seen by me and all the other twitterers who follow me and the person who sent the message. E.G: @LucasBlack Did you see that new episode of Q.I last night? I missed it becasue my house caught fire. If they only want me to see it, then they should use the Direct function. A direct message is sent as D LucasBlack. This will only be seen by me and the sender – no matter what the message contains. HowlinWolf50 says @LucasBlack How is everything going? I’ll see this as a REPLY because my name is at the very start – It won’t appear on the main Tweet stream. HowlinWolf50 says Hi @LucasBlack How is everything going? This is now just a normal tweet and I’ll see it as an @reply AND it’ll appear in the main Tweet stream. So….. what do I do to see all the ones about me that don’t have the @ at the front ? One thing twitter is good for is group chats and multiple individual conversations… but oh boy! these can mess your head up as tweets come in left, right and central! The way to deal with this is by using the Reply function. 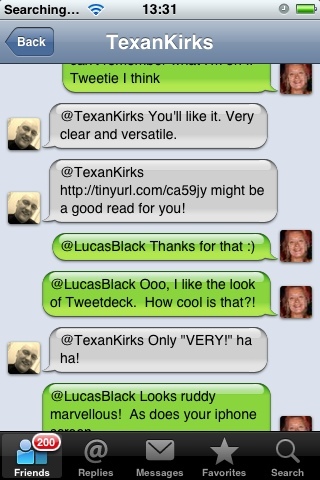 This is similar to the @LucasBlack messages we talked about – but by using the reply function it links the new reply tweet to the tweet the person is replying to. See the picture above to see what to click to send a reply. This reply option is really emphasized in the next picture (below). This picture is from my iPhone twitter application called Twitterfon. I am using it as a demonstration as it really highlights the power of the reply. If the tweeters hadn’t selected reply, then any of the tweets (messages) would have no link or anything to compare to. You’d end up with one statement made by someone that means nothing on it’s own…. so remember…. if you are replying to someones tweet – make sure you use the reply button. If you don’t it just confuses people. Now someone might want to copy that and let others read it (people who don’t follow me, so might miss that tweet I posted). Sarah Saner is a twitter friend of mine and she might like to spread the word of my blog (or else…grrrrr)… She can do this by Re-tweeting. A Re-Tweet is a bit like a forwarded email. It contains the message you want to spread, but it also credits the person who first wriote the message. You simply put the message (or a bit of it) into your message window, and add the originators name to the front of it…and infront of that add the letters RT…. so in Sarahs re-tweet of my message you would see…. Now if YOU want to get something spread around twitter you can always ask to be re-tweeted… BUT make sure you leave people enough characters over in your tweet to be able to put “RT @YOUR.NAME ” at the beginning of the message…. For me, I would need to leave 15 characters out of the 140 you can use in twitter. This leaves 125 characters for my message and 15 left over for the next person to re-tweet me…. Once you get into it you may find some peoples tweets are so good that you want to keep them safe to read again and again. This is easy (yes… really!). Just click on Favourite at the end of their message (as in the picture). Their tweet will now be saved into your Favourites tab at the side. You will come across a thing called a hashtag. This is often a letter or letters or word with # infront. This is used in conjunction with Search. It is mainly used when discussing topics that keep cropping up. The hashtag is typed into search and you will see all of those tagged tweets appear. LucasBlack says Great news everyone. Our NZ protest for the #blackout was a success!!! Now when anyone enters #blackout into the twitter search they will find my tweet in the collection. Quite simple… just log into TwitPic with your twitter login information and add pictures. You can send pictures from your phone or PC. Just upload an image, add a caption or message and hit POST IT. This will post a link to your picture AND the message straight to your twitter feed for people to see. I said it was simple! Note: For the more advanced TwitPic users….The moment you upload a picture from your PC, you will notice your avatar (the picture of you in the corner) will become the same image as your twitter avatar (the one next to all of your tweets).If you change your avator in twitter, you will need to upload any image into Twitpic to refresh the avator there. I am – and I’m trying to make it simple for you! The best thing to do is to dive in and have a go. It really is simple – and I’m always willing to give a hand when I am around. If you have any questions – or think I need to change something on here, then please let me know! I can only improve this blog if you tell me!!! If you want help, and you don’t know where to turn, then find me at @LucasBlack – But please note… I’m only as good as what I have found out by listening to others. I’m not God or Geek or Guru… I’m just a guy.